Outdated drivers may affect your PC performance and lead to system crashes. 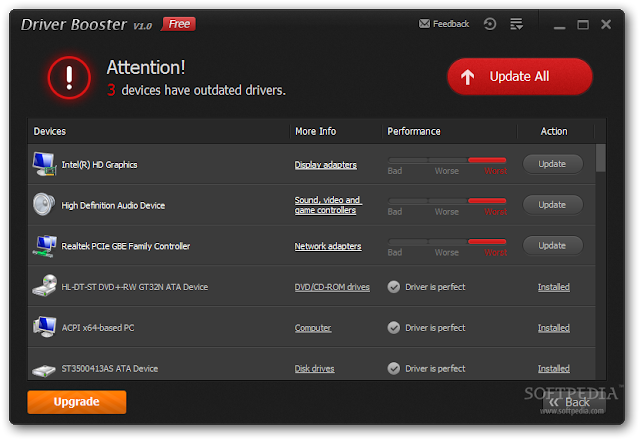 Driver Booster scans and identifies outdated drivers automatically, then downloads and installs the right update for you with just one click, saving you time. Once the updates have been installed, you will be prompted to perform a system reboot so that the changes can take effect. 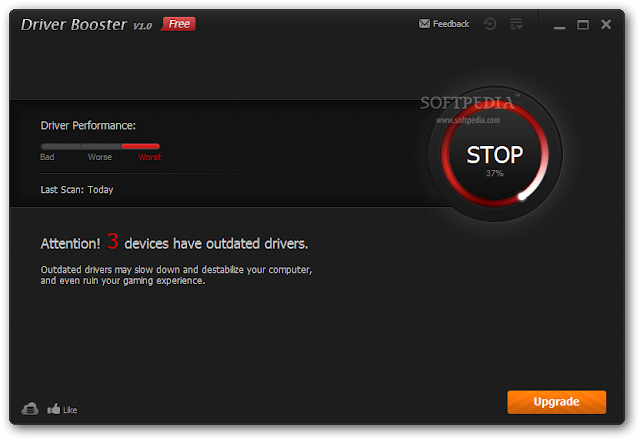 Moreover, it's specially designed to tweak drivers for best gaming performance. It's the right tool to protect your PC from hardware failures, conflicts, and system crashes. Keeping drivers up to date is a chore for most of the users. This activity is rarely carried out by beginner and average users; even more experienced ones, though aware of the benefits of this procedure, forget about installing the latest revisions. The performance of the entire system can be noticeably improved by adding the latest drivers to the system. Driver Booster from IObit has been designed as a simple solution for detecting outdated drivers, downloading and installing them. Everything works automatically and the user has to click only a few times in order to complete the operation. Installing Driver Booster is straightforward as the product does not require additional resources for proper functioning and no third-party software is pushed onto the system in the process. Looks are pretty simple, with the main screen displaying in a clear manner whether there are outdated drivers present on the system or not. In case of the former scenario a large “scan” button can initiate the detection procedure. Also available in the main application window is an assessment of the driver performance, which, as far as we could tell, relies on the version of the installed driver: the older it is, the worse the performance. During our tests, the detection process took under 15 seconds to complete, even on an older test machine. With a database currently holding 35,862 devices, it is quite difficult for Driver Booster to lack the necessary details about a hardware component. When the scan finishes, you are displayed the drivers that have a newer version available for download. 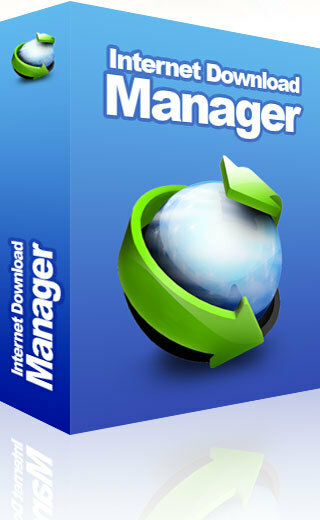 One click on the “Update All” button starts the process of downloading and installing the necessary files. By default, everything is carried out automatically in the background so you do not have to go through additional wizard windows or dialog boxes. This can be disabled in the configuration panel of the program, though.